The 1918 riots were a response to wartime inflation, low wages and commodity speculation. The price of rice doubled within a short space of time, and prices for other consumer goods were also high whilst wages remained low. Japan was also subject to an influenza pandemic in 1918-1919 like much of the rest of the world. However, rioting did not necessarily occur in the poorest areas, or amongst the poorest workers or Burakamin (outcastes). Most rioters were those in modern forms of employment, and usually from median income groups rather than the lowest paid - even in backward rural areas there was rapid industrialisation and peasants often held second occupations in manufacturing. Ａlthough there was a rice shortage in Japan, there was no famine, and riots often took the form of "self-reduction" of prices to pre-inflation prices rather than wholesale looting. The protests are largely held to have begun on 22 July at a fishing hamlet in Toyama (on the northern coast of Honshu), and almost simultaneously in other settlements along the Toyama bay. Fishermen's wives attempted to stop the export of grain in protest against high prices, in a style of protest which closely resembled traditional village uprisings, murakata ikki, which were a common feature in Japan from the 16th to 19th century and which increased dramatically during the Meiji period. Fishermen were mainly migrant workers, away from home for long periods, and therefore would not be up to date with price fluctuations and other local conditions, whilst their wages suffered due to wage deductions and enforced debt to boat owners. Many women worked as stevedores loading grain onto small ships or had other jobs around the shipment of grain. There was also a migration of thousands of women from Toyama to spinning mills and silk processing factories in the big industrial centres to augment family incomes. Protests in the Toyama prefecture continued throughout the wider national rioting until 4th October, with more than thirty separate incidents, each lasting up to several days and involving up to 2,000 protestors. The vast majority of the protests were organised and led by women, and involved everything from enforcing boycotts of grain loading (although rice was scarce nationwide, Toyama and neighbouring prefectures produced much of it), to attacks on rice merchants, sit-ins and marching on local officials. Much of this followed familiar rituals of protest which were not unusual in Japan, and many of the women involved would have experienced similar ones before, although the scale was noticeably bigger during August. In general the Toyama protests were suppressed less by police - who were generally ineffective due to the large numbers involved, and although they didn't come under direct attack might have escalated events had they extended repression beyond the arrests of ringleaders - and more by relief measures - generally discounted rice sold under the supervision of local officials as a result of grants by local rice merchants. These relief measures continued through 1919 long after the rioting had ceased. As well as the traditional protests, there was also widespread rioting by tenant farmers against landlords. This was part of a much longer dispute which didn't reach a national scale until the 1920s. Farmers would pay landlords in kind, mainly rice, which precipitated rioting during the grain shortage. In many cases farmers held part-time employment in manufacturing, however low wages here didn't result in strikes at the factories, and in many cases the new capitalist class tried to manipulate anti-landlord sentiment in favour of their own political power struggles against the landlords. Similar protests to those of the Toyama fishermens' wives began shortly afterwards in the Oyayama prefecture in Western Honshu, also a fishing area. A matter of days afterwards there were major riots in all of Japan's urban centres. 9 August, Nagoya3, over 500 people met around the fountain in Tsurumai park. The meeting was unscheduled, and may have been a spontaneous response to newspaper reports of Toyama and the daily increase in rice prices. Anger was directed against both rice brokers and Nariken (Japan's nouveau riche), including a passing group of Nariken in a car with some Geisha. The numbers had swelled to 30,000 at a meeting by 9pm the next day, which was dispersed by police around eleven o'clock. Meetings were held every evening in Tsurumai park upto the 17th August and other public spaces, where workers, journalists and others would address the crowd. Once dispersed by the police they would then damage shop fronts in major shopping precincts on their way to attack rice merchants. The largest incident was on 12 August when over 50,000 met in the park, then travelled to the rice merchants at Komeya-Cho armed with clubs and roof tiles, smashing police boxes and shop windows along the way. They were met by a much enlarged police presence on their arrival. Police were forbidden from drawing swords, but did so anyway, resulting in prolonged street fighting in this area and around government buildings and other important areas of the city. 42 police officers injured and an unspecified number of rioters. Although the police were able to protect the main rice merchants, six police boxes were destroyed and ten rice dealers damaged, along with several small fires. A significant programme of discounted rice sales at less than half market price began the next day, with sales held between between 4-8pm. This diverted workers' journeys away from the parks on their way home towards the rice sales, and began to dissipate protests, although over 35,000 appeared at Tsurumai park the next day. The park was barricaded by police on 14 August, although over 10,000 met at Osu Kannon temple that evening instead. Police estimated that a total of 130,000 people took part in the Nagoya riots, out of a total population of 437,000. Up to 10 million out of a population of 56 million took part in the riots nationally It is worth noting that the majority of Japan's population in 1918 were minors. By 11 August the riots had spread to the rest of the Kansai region; Osaka, Kobe, Kure and Hiroshima all experienced rioting, followed by Tokyo the next day. This continued until 20th August with the quelling of the Sasebo uprising. The largest cities in the industrial areas of Kansai and Kanto regions saw riots last up to a week (Nagoya's were the longest at ten days), whilst rioting of up to two days took place in around 38 cities throughout most of Japan except the far north and Okinawa. Osaka saw the largest protests, with c. 230,000 residents involved. The riots coincided with the national Obon holiday - a week of matsuri (festivals) which involves traditional dancing and lots of sake and beer drinking. This meant that crowds would form naturally in the evenings, and led to a festive mood during many of the riots. In the early stages, and in most smaller cities, they were mainly peaceful protests (with the threat of violence), forcing grain sellers to reduce prices by around half - or to levels from the year before. As the riots continued, and especially in Osaka and Tokyo, rice dealers were increasingly looted (or the price paid was small denomination coins) and other commodities, such as coal, were targeted. Due to the severe housing shortage in major Japanese cities, rioters also attacked the offices of estate agents, many of whom were involved in illegal price gouging. As in Nagoya, there was armed conflict with police in several cities, and rioters set grain importing companies, police boxes and a pro-government newspaper office in Kobe on fire. Attacks were primarily against property, the police and troops, with individual rice dealers and their homes left untouched. In August 1918, 26,000 workers were involved in strikes for better wages and working conditions. Unions were banned, and the more informal labour associations which became Japan's trade unions later on had little influence, and strikes were illegal, however this was one of the largest single instances of strike action in the country's history up to that point. 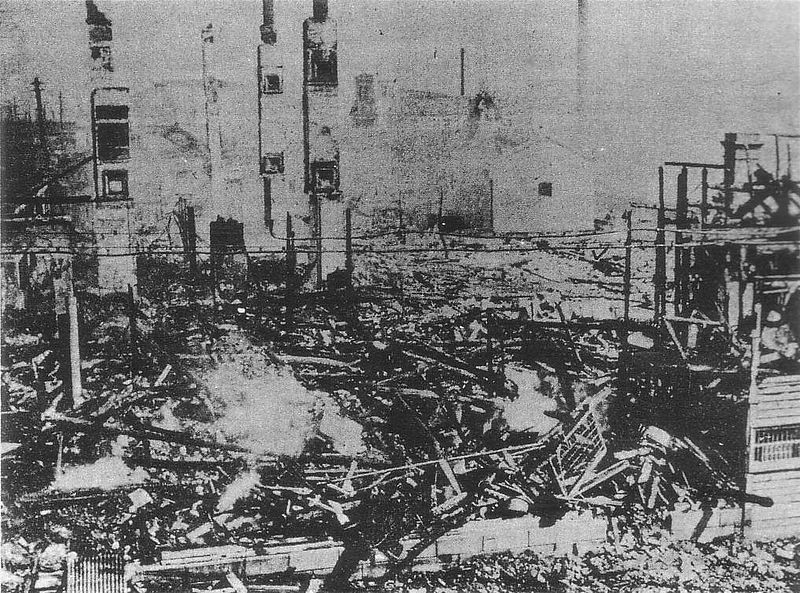 Many of these strikes turned violent, notably at the Mitsubishi shipyard in Kobe, however strikes by skilled workers in these industries and in the mines were disconnected from the street protests of day labourers and others outside the shipyard or factory gates, and wrokers at these concerns didn't appear among those arrested for street rioting apart from in isolated cases. Coal was especially important to Japan's increasingly industrial economy, and although state-owned, was mainly operated by the Mitsui and Mitsubishi companies. Working conditions were extremely poor, with large numbers of fatal accidents - 1,572 deaths recorded in 1914. Miners often worked in slave-labour conditions. They were kept in debt to the mining companies and gang masters, and often paid in company scrip rather than real wages, lived in very poor company supplied housing, literally sheds in some instances, and were subject to numerous diseases as a result of overcrowding and bad sanitation. High demand for coal led to improved conditions up to 1918, and also an influx of new workers into what had been the lowest status occupation in Japan. Mines employed both women and men, and some entire families worked down the mines since often children were employed. Also many of the zaibutsu operated coal mines, despite using company stores and scrip, maintained discounted rice supplies which insulated miners from the wider market to some extent, this meant that the reasons for riots in the coal fields were largely independent from the rural and urban riots. Miners were involved in strikes more than most other workers in Japan at the time - at the Takashima mines, between 1870 and 1883 there were five violent uprisings. The mines transferred from convict to "free" labour in 1881, although workers were still tied by debt and subject to public beatings. There were also violent strikes at the Poronai mine in Hokkaido in 1907, after management reneged an earlier agreement won by a more traditional strike. In July 1917, 50 workers walked out at the Tsunemi mine in Moji demanding higher wages, followed a few weeks later by miners at the Mitsubishi owned Yoshitani pit. In May 1918, 1,600 miners refused to work and attacked company offices at the Nakazuru mine. The first dispute following the Toyama protests began towards the end of rioting in Japan's urban centres, on the 17 August in Yamaguchi prefecture. The riots spread to Fukushima, Fukuoka, Kumamoto and Saga prefectures, lasting from 2-3 days up to a week, and involving from less than one hundred to c.10,000 workers. The disputes were mainly around rice prices, wages, company stores, forced savings schemes, working conditions and management-employee relations - all inter-related given the close involvement of the mining companies in miners' domestic lives. Miners both raised immediate material demands such as a doubling of wages, and also called into question the entire management system of labour, from the company stores to methods of coal grading - all of which had changed significantly after the large zaibutsu companies had took over. The miners' strikes were often highly organised, started by small groups of workers meeting in secret, who then handed out demands in leaflets and convened mass meetings. Miners prepared for attacks on the mine compounds by setting up kitchens in order to maintain food supplies during protests, attempted to spread strikes to other mines run by the same companies, and enforced strikes with notices threatening repercussions against scabs. Demands were raised peacefully at first, sometimes leading to immediate gains after a short work stoppage. However when these were refused it led to pitched battles involving arson and dynamite attacks on mine buildings and troops sent to suppress the strikes. Although there was a lot of property damage, most mines were left fundamentally intact so that work could continue later, and peripheral buildings not owned by the mine were left untouched. As with the urban riots, the disputes corresponded with the Obon matsuri which led makeshift refreshment stands stocking looted sake4, and attacks on company buildings interspersed with dancing. In most cases the larger riots were crushed by troop mobilisations, resulting in pitched battles involving dynamite, and several massacres when soldiers fired on miners. Deaths resulted in an immediate cessation of disputes, as crowds dispersed and police carried out mass arrests. At Mineji, although the protest had been crushed by armed troops, strikers continued matsurifestivities a full day later, dancing defiantly whilst surrounded within the mine compound. As evidenced by the leader of the privy council in the quote above, the authorites blamed the influence of anarchists, socialists and the recent Russian Revolution on the riots. However, although anarchists and socialists were subject to widespread surveillance and arrests during the period, including the early arrest of Osugi Sakae, recent research suggests their actual influence was minimal in inciting the rioting. In all cases, the rioters primary concern was immediate material demands. The urban rioters extended this to calls for the government to stand down, and the miners challenged the organisation of their work, but although anarchists and socialists certainly participated in the riots, there was little revolutionary sentiment during the period; many speakers at mass rallies invoking the Emporer against local officials and national politicians - giving the riots a sometimes nationalist content (especially when lower-grade foreign rice was introduced as part of relief measures) similar to the Hibiya riot thirteen years earlier. As such, although the riots were extremely widespread, they were unable to go beyond quite limited demands, and the main bout of rioting was finished by September, with smaller incidents recorded up to December. Rioters often continued to go to work during the events, which led to a rapid loss of stamina as they would work 10-12 hours days then riot most of the night. Although the shipyard, metal and coal mine riots occurred at the same time, there appears to have been little mixing of these groups. Burukamin only joined the riots sporadically - they made up a large percentage of those arrested, but many settlements did not join the riots, partly as a result of early relief measures in those areas aimed at pacifying Japan's most marginalised and feared social group. There were almost no reports of mutinies amongst troops or police. Some police deserted during the riots, and many reservists and youth groups were actively involved in organising riots, alongside firefighters and other low-level state employees. The willingness of troops to fire on protestors, and the rapid and widespread arrests of rioters in general slowed the pace of rioting rather than excacerbating it. This and the fairly quick relief measures once the riots had spread to urban centres meant most individual protests lasted no longer than about ten days, despite the events overall lasting several weeks or months. The 1918 riots are an important episode in Japanese history and one that has been given little attention by either Japanese and western researchers. In terms of their breadth and depth, and also in their relation to events around the world at the end of the First World War they are interesting both for their continuity with previous disputes and forms or protest, and for their apparent "spontenaity" with little influence of leftist or anarchist groups. The most comprehensive English language source on the riots is Rioters and Citizens. Mass Protest in Imperial Japan, by Michael Lewis, from which most of the factual information in this article was taken.